Playing the Djembe is Easy! Many people struggle with a hidden desire to play drums. Whether it's the glamour of a drummer's life, or the unstoppable need to beat out a rhythm to a song, drumming is a passion, and one that should be indulged. Community Drum Jam where drummers of all skill levels enjoy the freedom of the beat. No special skills required to reap the benefits of drumming. Nothing says that a novice drummer can't enjoy the ease and simplicity of a hand drum, over the complex and intimidating drum set. In fact, a hand drum like a djembe can easily fulfill all the needs of a drummer, and more. The djembe is easy to learn, no matter the musical skill or ability of the person it sits before. Starting out with djembe drumming is as simple as beating out the rhythm to a favorite song. While there are certainly techniques to "proper" djembe playing, for the new drummer, just hitting the skin is a huge step on the road to ultimate djembe mastery. Once the new djembe drummer is comfortable with the drum, and has fallen in love with its charming tones and unsurpassed rhythmic magic, learning those djembe techniques may be the next step. From learning basic djembe tones, like the bass, slap and tone, a djembe drummer can start to understand that this simple drum has a complex nature to it as well. From there, the drummer can learn a basic African djembe rhythm, like the Calypso, and then move on to more traditional djembe beats like the Kuku, Sunu or Kawa rhythms. There are even Hip Hop, Rock and Funk rhythms that are perfect for the djembe. Learning to play the djembe can have an amazing effect on the life of the drummer. 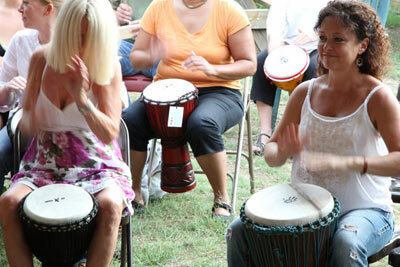 Djembe drumming gives a creative outlet that is inspired by a love of music, and the root of rhythm. Also, drumming and rhythm have a positive effect on stress and anxiety reduction, can help improve communication skills and are just fun for everyone. Playing the djembe is nothing short of a life-changing experience that is both personal, and full of community and history, and brings smiles to faces with just a few drum beats.